* Noir Marine goes on with a brisk spicy peppermint that will wake you up with its strong projection. 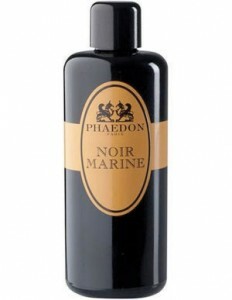 * Phaedon is a new line of fragrances by Pierre Guillaume. This was kept secret at first in attempt to keep the focus on the fragrances rather than the names involved. * The peppermint stays present and is sweetened up with a really nice tobacco note. The tobacco is not overwhelming or ‘old man’ish – its present and acts as a nice sweet transition. * I do not like aquatic (water/ocean) fragrances, so when my friend recommended that I try Noir Marine, I laughed. Throughout the life of the scent, I don’t get any aquatic notes at all… maybe that’s why it’s so dark (or noir)? * After a few hours, the pepper winds down and the tobacco transitions into really warming and nice resins that last a long time. Summary: I was introduced to Pierre Guillaume’s Parfum line when I was in Paris last year and absolutely love Aomassia, Bois de Copaiba, and Un Crime Exotique. Noir Marine fits into that line quite well. The longevity is absolutely wonderful, with the sweet resinous base lasting more than 12 hours on my skin. If you apply this an hour before work, this could be an office-friendly scent. Otherwise, it makes for a great after-work pick-me-up that will last until the next day. Phaedon fragrances are available from LuckyScent and The Perfume Shoppe. Add this to the long list of lines that I haven’t tried but want to try. One of my favorite smells is the sea. It’s a shame that perfume wants aquatic to mean squeaky clean when the ocean is one of the dirtiest, darkest smelling smells ever!